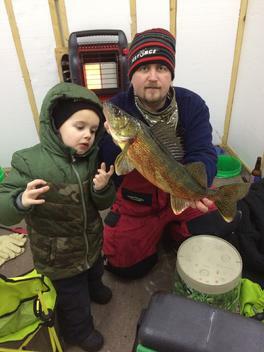 This healthy 22 1/2" walleye caught by Paul Sydloski on February 12, 2019. photo submitted by Todd Grams. Thanks for send the photo Todd! The Lake Sarah Association completed the 2018 stocking of walleye on October 25, 2018. 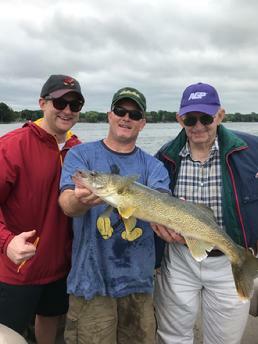 Kent Roers and Marcus Zahn met Ron Rademacher to release the 1000+ walleye fingerlings from Joe Slavec's dock in the mid-lake channel. Since the programs inception in 2006 this program has introduced more than 290,000 walleye fry and 9,000 walleye fingerlings to lake Sarah. 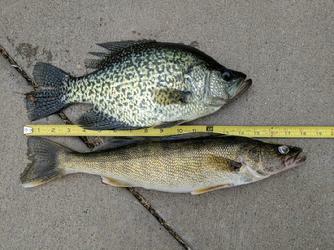 Help support continued walleye stocking in lake Sarah! Click the Paypal button on left to donate to the stocking program with any major credit card or bank balance transfer. Your tax deductible donations are greatly appreciated! This 24" walleye caught by 83 year old Earl Christy, was one of 3 walleyes he caught besting his 21.5" walleye last summer. He is the Duke of Earl" when it comes to Lake Sarah walleyes. Also pictured is his grandson Jacob Christy and Joe Baker. Caught by Ayden Fults (Lake Sarah Hgts) on Friday, December 29 as the sun was just starting to go down. Measured 25” and was thick and heavy! On June 9th 2017, Earl Christy from rural Nebraska visited Lake Sarah and caught this 21.5" walleye Holding the fish is Earl's son Randy, and his grandson Jacob. Special thanks to Mary VanBeusekom for her pontoon that made this day possible. This dandy 16" walleye was caught by Jeff Knopik's son-in-law Sam on June 9, 2017. Location and bait used is a family secret LOL. Thanks for sending the photo Jeff! by John Zitzloff, the grandson of Eileen Klaers. Thanks for sending us your photo! 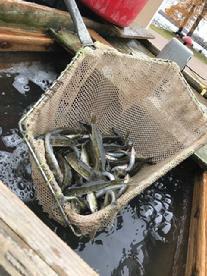 Volunteers from the Lake Sarah Improvement Association (LSIA) stocked our lake with another 1000 walleye fingerlings on 10/25/16. 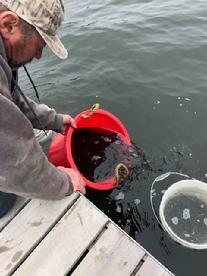 LSIA Director Brent Lau worked with Ron Rademacher of Radermacher Ponds to place these walleyes into the lake. Thank You to all the lake neighbors who contribute to our increasing walleye population! December 2016 - 18" Lake Sarah walleye was caught on 12/28/16 by a friend of Jeff Pitzenberger. 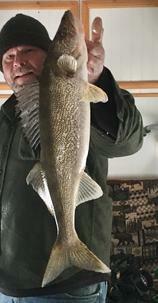 The same angler also reported a healthy 16" walleye caught on December 29. June 2015 - Joe Baker - 19.5" walleye caught on 6/14/15 in Sarah on a jig and a leech. Joe also caught a 17.5" the same day. May 2014 - Joe Baker reports catching a nice healthy 16" walleye at an undisclosed location on lake Sarah. June 28, 2012 - Jen Howell (S. Lake Sarah Drive) reports catching a 12" walleye followed by a 14" walleye (photo in album below) within 5 minutes of each other on June 28, 2012 using a white Mister Twister on lake Sarah's west bay. First 16" walleye caught - Doug Lawman with the first 16" walleye caught in Lake Sarah since the stocking program was initiated. Doug caught the new record on August 6, 2011 on a Mepps spinner cast from his dock eclipsing the 15" walleye caught by his son a few weeks prior. Congratulations Doug! The Lake Sarah stocking program is entirely funded by contributions as the Minnesota DNR has to date declined to assist, anyone wishing to contribute to the walleye stocking program should contact any Lake Sarah Improvement Association Board Member for information. click on any of the photos below for more detailed info and full size image. If you catch a walleye on lake Sarah please email us your photo with the date and length of the fish so we can continue to track the progress of our stocking efforts! The result of prior years stocking effort! A healthy 13" walleye caught in June 2010 and released by Jen Howell. 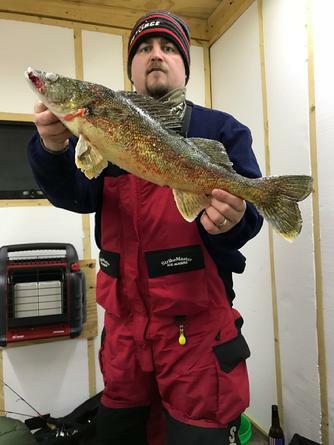 Following several years of privately funded (no assistance from the MN DNR) walleye stocking, reports of walleyes being caught started coming in. A few small unconfirmed reports in the summer of 2009 followed by a wave of walleye catching stories in 2010 and 2011! Anyone catching a walleye in lake sarah is encouraged to report the size of the fish and date of catch to this website (email). Photos of the catch will be published if provided. The Lake Sarah Walleyes, Lake Sarah Improvement Association, and contributing citizens encourage release of all walleye caught until such a time as the population can build to a sustainable level. Thank you to all those who have contributed to the stocking fund and to those who have actively worked to bring the walleyes back to Lake Sarah! February 9, 2013 - Kraig Smeby reportedly caught 2 walleyes each 18" on the west bay through the ice for a new record! Jeff Pitzenberger caught a 16.5" walleye on the east bay. August 5, 2012 - Doug Lawman (Woodhill) 14" walleye caught near Campbell's wswimraft at 1:30pm. June 28, 2012 - Jen Howell (S. Lake Sarah Drive) reports catching a 12" walleye followed by a 14" walleye (photo in album below) within 5 minutes of each other using a white Mister Twister on lake Sarah's west bay. June 12, 2012 - Mark Shepperd (fishing with Brent Lau of S. Lake sarah Dr.) 12.5" walleye on Lake Sarah's east bay using a jig with a plastic worm. August 6, 2011, report from Doug Lawman - caught a 16" walleye eclipsing his son's previous report. Caught from his dock off Woodhill Dr. also on a Mepps spinner. walleye released. June 2011, report from Jessie L. - caught a 15" walleye casting a Mepps spinner from his dock. Released. June 25, 2010 report from Mario Crespo - caught a small Walleye on June 25th, just southwest of the channel. It was only about 12" long but it looked very healthy (put up a good fight for a little guy). June 18, 2010 report from the Howell's - I just wanted to let you know that my wife caught another 13" walleye tonight, 6/17, at about 9pm. It was caught at the same place as the other two. I forgot to mention in my last e-mail what they were caught with. The first two were caught with an orange mister twister. Today's was caught with an orange/yellow swim'n grub. June 16, 2010 report from the Smeby's - Kraig Smeby caught & released a 7" walleye on Memorial weekend. 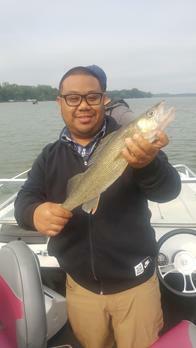 June 13, 2020 - Joe reports that Nadia S. caught an 8" walleye this am and he caught a 12" in the pm today. June 9, 2010 report from Joe S. - Just wanted to let you know the signs of success are showing up! 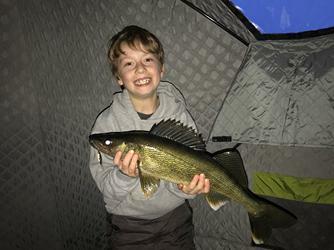 In addition to the 12" walleye I caught on the opener morning - my friend's young kid caught one a week later, I caught 4 over the weekend with my Dad, Fred Lang Jr. reported catching one yesterday, and Bob Beadle told me of a friend of his who caught one all in the period of 2 weeks. They are all in the 10-12" category although Fred Lang Jr. claims his was a little bigger. Walleye Opener success! 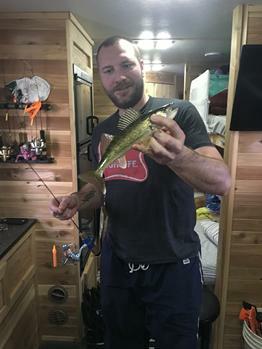 Joe S. reports catching his first walleye in Lake Sarah on Saturday morning 5/15/10 am at 6:04 am off the dock. 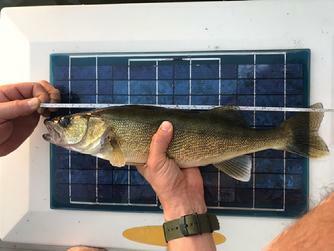 The walleye measured 12" long and looked very healthy!